Research Programme 2005 – 2007. The outcome of research by Robin Sewell was the KYMA exhibition at the Learningstone Gallery (Drill Hall) on Portland that opened on the 2nd of September 2006 for one month. The gallery space was constructed and painted by PSQT and six volunteers from the community over ten days. Final preparation of the space included the construction of a film/video projection area using fireproofed black out material and data projection equipment. 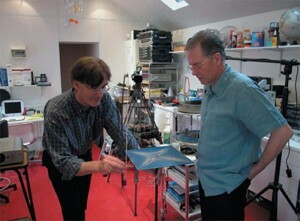 – A sequence of eight photographic stills from the ‘cymascope’ of sound waves from the ringing stones. – Eight wall panel paintings measuring 8ft x 4ft each, comprising four black and white ‘drawings’ and four coloured paintings. – A 15-minute film, ‘Nomadic Particle’, was projected onto a large (1.5 tons) cut section of Portland stone. The film ‘The Nomadic Particle’ describes the nature of particles, from their random displacement towards form and structure via the forces of vibration (sound). This shows how inanimate matter/particles are made animate within the vicinity of such forces and find form/structure and symmetry. The monochrome works were made from a dry emery powder compound on a white panel base to become ‘drawings’. With higher relief surfaces and over priming the works become paintings through the layering of colour (acrylic paint). PSQT selected a large number of stones that ring with different tones, and invited artist Robin Sewell to develop sound recordings, to see how they could influence his new work concerned with sound and vibration. 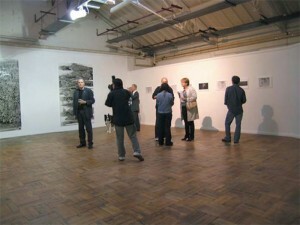 Robin used transmitted sound recorded from the stones to create ‘drawings’, photographs and video, exhibited at the Drill Hall during September 2006. The background to the research by Robin Sewell relates to PSQT recordings and collection of sounds made over several years, exemplifying the sound properties of Portland stone, which has the quality of ringing like a bell, with both high and low notes, when struck. – What is the relationship between tone and pitch, the structure of the stone and different beds of stone? – What patterns and forms could be created in dust particles, through the transmission of sound recorded from Portland stone? – Could the patterns and forms created be a ‘visual equivalent’ or ‘visual key’ to the pitch and tone of sounds that relate to the different beds of stone used? The research examined how audio and visual signals can have interdependency on each other and how we can sense that an image is made from a particular sound/vibration, and likewise, that a specific sound should give rise to a particular form. PSQT selected and purchased forty stones with an extraordinary range of tones, transported them to the Drill Hall and arranged them in the form of a lithophone. 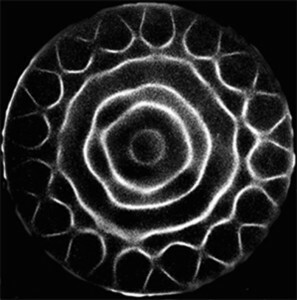 These recorded sounds were used as signals to convert to imagery via a cymascope. Simply described, this a chamber into which sound is channelled underneath a thin taught membrane that is caused to vibrate by the sound. 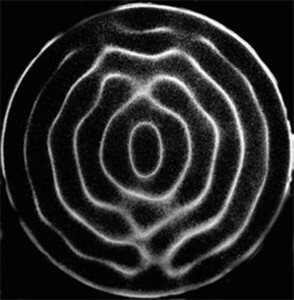 Robin was very fortunate to meet British acoustic engineer John Reid, who is at the forefront of research into the phenomena of cymatics. Robin built a version of John Reid’s patented CymaScope made under his supervision. 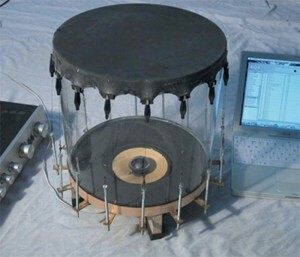 The CymaScope is a sensitive instrument that forms and reforms fluids and dry powdered materials into patterns generated from a given sound/vibration input. The exhibition travelled to the Herbert Read Gallery in Canterbury in March 2007 and opened with a day-long event comprising speakers and performers who examined the very many avenues related to sound / vibration and its effect on materials and bodies.